I'm taking my students to New York next month and I'm at a loss as to what to show them. I think the MOMA is too expensive for them, and MICA is not subsidizing, so I'm taking them to the Met instead (and telling them they can pay a dollar for entrance; sorry, Metmuseum). In planning the trip, I realized that I only really visit the same three galleries every time I'm there (the Velazquez room, the Sargent room, the Rembrandt room). I am such a fuddy-duddy! If anyone has any thoughts about not-to-be-missed paintings, preferably after the 1900s, that are at the Met, please email me (hyeseungs@gmail.com) or comment here (trying to be better about my comments:)). I'm super jazzed about the new Islamic art galleries. The New York Times was really prostituting itself over them this morning in the paper. PARIS — Spending an idle morning watching people look at art is hardly a scientific experiment, but it rekindles a perennial question: What exactly are we looking for when we roam as tourists around museums? As with so many things right in front of us, the answer may be no less useful for being familiar. 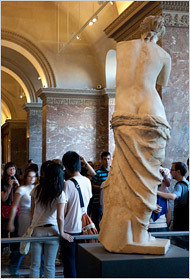 Museums can both broaden a visitor’s world and provide reassuring touchstones like the Venus de Milo at the Louvre. At the Louvre the other day, in the Pavillon des Sessions, two young women in flowered dresses meandered through the gallery. They paused and circled around a few sculptures. They took their time. They looked slowly. The pavilion puts some 100 immaculate objects from outside Europe on permanent view in a ground floor suite of cool, silent galleries at one end of the museum. Feathered masks from Alaska, ancient bowls from the Philippines, Mayan stone portraits and the most amazing Zulu spoon carved from wood in the abstracted S-shape of a slender young woman take no back seat, aesthetically speaking, to the great Titians and Chardins upstairs. The young women were unusual for stopping. Most of the museum’s visitors passed through the gallery oblivious. A few game tourists glanced vainly in guidebooks or hopefully at wall labels, as if learning that one or another of these sculptures came from Papua New Guinea or Hawaii or the Archipelago of Santa Cruz, or that a work was three centuries old or maybe four might help them see what was, plain as day, just before them. Almost nobody, over the course of that hour or two, paused before any object for as long as a full minute. Only a 17th-century wood sculpture of a copulating couple, from San Cristobal in the Solomon Islands, placed near an exit, caused several tourists to point, smile and snap a photo, but without really breaking stride. Visiting museums has always been about self-improvement. Partly we seem to go to them to find something we already recognize, something that gives us our bearings: think of the scrum of tourists invariably gathered around the Mona Lisa. At one time a highly educated Westerner read perhaps 100 books, all of them closely. Today we read hundreds of books, or maybe none, but rarely any with the same intensity. Travelers who took the Grand Tour across Europe during the 18th century spent months and years learning languages, meeting politicians, philosophers and artists and bore sketchbooks in which to draw and paint — to record their memories and help them see better. Cameras replaced sketching by the last century; convenience trumped engagement, the viewfinder afforded emotional distance and many people no longer felt the same urgency to look. It became possible to imagine that because a reproduction of an image was safely squirreled away in a camera or cell phone, or because it was eternally available on the Web, dawdling before an original was a waste of time, especially with so much ground to cover. We could dream about covering lots of ground thanks to expanding collections and faster means of transportation. At the same time, the canon of art that provided guideposts to tell people where to go and what to look at was gradually dismantled. A core of shared values yielded to an equality among visual materials. This was good and necessary, up to a point. Millions of images came to compete for our attention. Liberated by a proliferation, Western culture was also set adrift in an ocean of passing stimulation, with no anchors to secure it. So tourists now wander through museums, seeking to fulfill their lifetime’s art history requirement in a day, wondering whether it may now be the quantity of material they pass by rather than the quality of concentration they bring to what few things they choose to focus upon that determines whether they have “done” the Louvre. It’s self-improvement on the fly. The art historian T. J. Clark, who during the 1970s and ’80s pioneered a kind of analysis that rejected old-school connoisseurship in favor of art in the context of social and political affairs, has lately written a book about devoting several months of his time to looking intently at two paintings by Poussin. Slow looking, like slow cooking, may yet become the new radical chic. Until then we grapple with our impatience and cultural cornucopia. Recently, I bought a couple of sketchbooks to draw with my 10-year-old in St. Peter’s and elsewhere around Rome, just for the fun of it, not because we’re any good, but to help us look more slowly and carefully at what we found. Crowds occasionally gathered around us as if we were doing something totally strange and novel, as opposed to something normal, which sketching used to be. I almost hesitate to mention our sketching. It seems pretentious and old-fogeyish in a cultural moment when we can too easily feel uncomfortable and almost ashamed just to look hard. Artists fortunately remind us that there’s in fact no single, correct way to look at any work of art, save for with an open mind and patience. If you have ever gone to a museum with a good artist you probably discovered that they don’t worry so much about what art history books or wall labels tell them is right or wrong, because they’re selfish consumers, freed to look by their own interests. Back to those two young women at the Louvre: aspiring artists or merely curious, they didn’t plant themselves forever in front of the sculptures but they stopped just long enough to laugh and cluck and stare, and they skipped the wall labels until afterward. They looked, in other words. And they seemed to have a very good time. Leaving, they caught sight of a sculptured effigy from Papua New Guinea with a feathered nose, which appeared, by virtue of its wide eyes and open hands positioned on either side of its head, as if it were taunting them. They thought for a moment. “Nyah-nyah,” they said in unison. Then blew him a raspberry.